My original hatch cover floated off into the Chesapeake bay on a dinghy loaded with two iced up coolers one night while on vacation. As a result, I had to improvise a new hatch cover. The original replacement was just a piece of plywood cut to size that dropped into the original guides on either side of the hatchway. This worked, but the one-piece hatch cover proved to just be too big and clumsy. 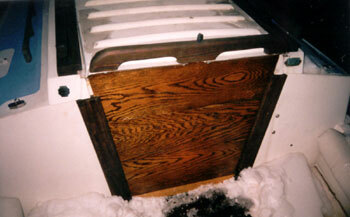 I later made a hatch cover that is four pieces of cedar wood that join together to form the hatch cover door. The sides are flat, but he joining edges were routed to form lap joints. The lap joint is what keeps the water (rain) from passing through into the cabin. 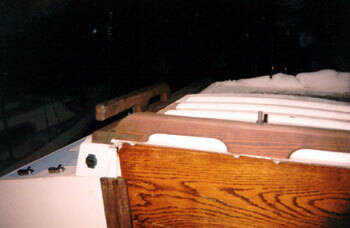 To make this work I also replaced the two wooden hatch cover door guides on either side of the hatchway. Again, these were made out of cedar wood (2 x 4 with a rabbit joint routed into one side). I routed out a slot for the hatch cover pieces to drop into, and then used galvanized 3/8" lag bolts installed from inside the cabin to secure the vertical door guides in place. This works really well, so if you ever lose your hatch cover to a dinghy that just seemed to float off into the distance.